When I was a new client, changing to the Well of Life way of eating was a daunting task. I vividly remember spending three hours every time I went to the grocery store scouring the aisles, reading food labels, and trying to figure out what was Well-approved and what wasn’t. To say I was overwhelmed is a huge understatement. I quickly learned that food labels can be quite misleading. I discovered that foods that I once thought were healthy were actually heavily processed and full of toxins. I realized that I had to be a savvy consumer, and I must learn all that I can about the food I consume and the products I use so that I know what’s going into my daughter’s, and my, body. Being an educated consumer can take the fear out of shopping and reading labels. The more you know, the easier it is to purchase healthy foods for you and your family. Fortified or Enriched – During processing or manufacturing, the inherent nutrients were stripped from the food, so synthetic replacements are added back in. Natural – In the US, there is no regulation for use of this term. “Natural” only means that the manufacturer used a natural source for the product at some point. No Added Sugar – A food may still be high in naturally-occurring sugar, or may have sugar substitutes/artificial sweeteners added. Gluten-Free – The product cannot contain wheat, spelt, rye or barley. The food can still be made with refined grains, fats, and sugars. This term is largely considered a marketing ploy to coax people into thinking the products are healthier, thus spending more money. Some organic ingredients – products made with less than 70% organic ingredients can label individual ingredients as organic. Made with organic – at least 70% of the product’s ingredients are organic; the remaining 30% can be conventional but still must not be genetically engineered, irradiated, or grown with sewage sludge. Organic – 95% (or more) of the ingredients are organic and GMO-free; can have USDA Certified Organic label. 100% organic – all ingredients are completely organic (therefore GMO-free); can have USDA Certified Organic label. Sugar substitutes, artificial sweeteners, and sugar alcohols – Many of these chemicals dull the taste buds, disrupt hunger signals, cause hormonal imbalances, cause overeating, increase risk of diabetes, pollute the water supply, and they are genetically modified. Check out this website for more information on the dangers of artificial sweeteners. Learning the different terms and phrases used in food product labeling will allow you to shop confidently while avoiding harmful ingredients. 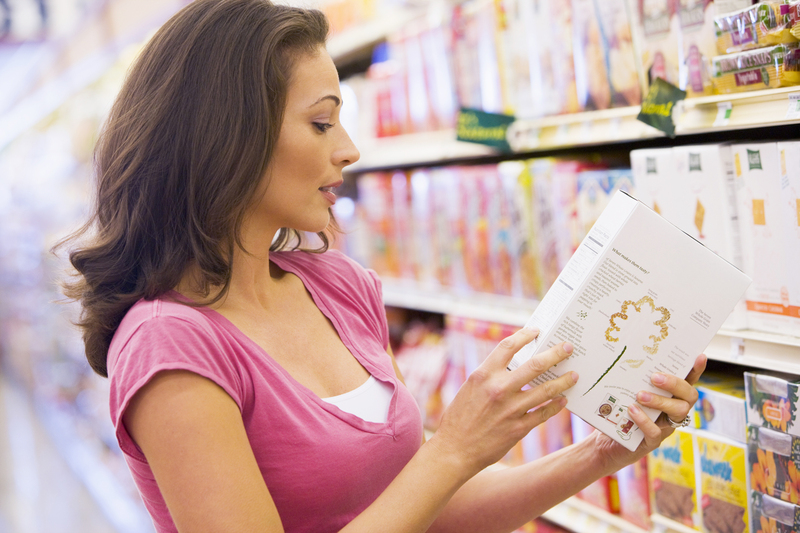 Now that you know more about deciphering food labels, you can conquer the grocery store! Happy shopping!